I made these guys last night. I don't bake very often, but I do enjoy it. 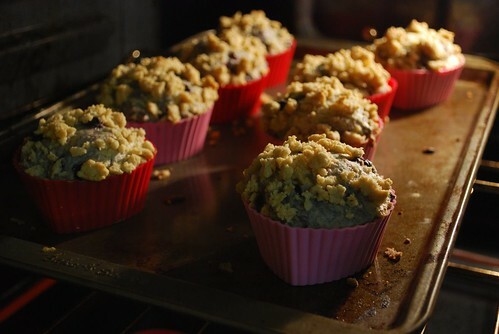 These are Blueberry Crumb Muffins from The Modern Baker, made with formerly frozen wild blueberries -- so delicious! I halved the recipe (which yields 12) but spread the batter into 8 of these little silicone heart-shaped molds. I then proceeded to eat three of them over the course of the evening. The crumb topping, made of butter, brown sugar, and cinnamon, is irresistible. We've been eating at home almost every day lately. It's so nice! Without really trying, we've been eating simple meals with in-season fruits and vegetables, thanks to our subscription to Martha Stewart Everyday Food magazine (a bonus: the spines of the magazine are so colourful that they make great decor, too!). As a result, I've been able to spend my eating-out budget -- not so much a "budget" as money I spend on the most frivolous whim at my favourite, inexpensive restaurants -- on things like $20 clearance dresses from Zara. I win! haha! funniest line, you win! Indeed you win with new dresses! ooh! those muffins look delicious! They look professional!